They look as if they have had their throats cut!! How could anyone have designed such horrible vestments? And is that Pope John Paul II in the middle looking decidedly embarrassed? On the subject of Garabandal I remember going to a talk here in Brighton in the 60s (above the Co-op store in London Road) about the happenings in Garabandal. I came away decidedly unconvinced and believe that the so called apparitions have now been dismissed as fradulent or at least not proven. Don't know much about it other than that St Pio of Pietrelcina believed they were authentic, apparently. "And is that Pope John Paul II in the middle looking decidedly embarrassed?" 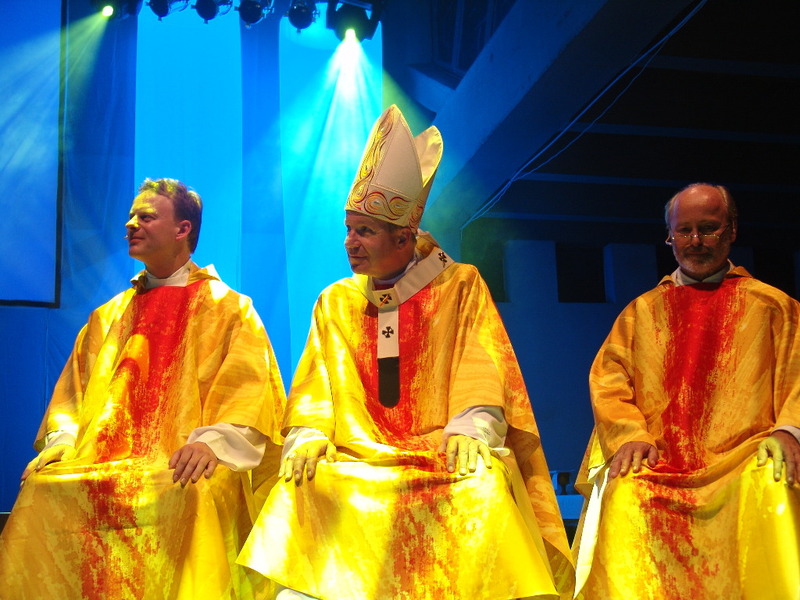 No this is our Austrian neighbor Cardinal Schönborn, a member of the Ratzinger Student Circle. He is famous for his m(a)esses. The spirit of VII Italians are back in control which is what the conclave (majority Italians) intended. And it becomes clearer by the minute what Pope Benedict had to put up with. The pity of it is that Benedict did not feel able to extinguish that majority while in office. Under this pontificate dissenters are emboldened with more than a whiff of that oh-so-denigrated triumphalism. Will the orthodox hierarchy, so few of them, become marginalised? It seems so. We have to pray, pray, pray and remember that in times past it was the laity which held fast while many of the hierarchy wavered. While history may repeat itself, what's different this time around is the worldwide presence of the Catholic blogs, the cavalry of the Church Militant. You must not retreat. Is that so? Your comment encourages me to google further. The visions have been declared false by the local Bishop. The people who said Padre Pio believed in them were....,the seers (so called) themselves! There is a blog called What is Garabandal?. Information on current position on alleged apparitions on right hand side of page . There seems to be an awful lot on the web both for and against Garabandal. Some websites promote it and others dismiss it. I was interested to read a comment by a Carmelite Friar that 'we do not have proof that St Pio said any such thing - it was always second hand.' And elsewhere someone writes that St Pio said that La Salette was a hoax. This apparition has been authenticated by the Church but like all the apparitions, Catholics are free to accept or not accept even the authenticated ones. There are far too many sites to visit . They seem to range from the 'mark of satan' through the 'harmless hoax' to 'genuine'. The Spanish Bishops however have been quoted as saying that the Garabandal apparitions are 'not worthy of credence'. The so called seer Vassula is quoted as being a 'big fan of Garabandal' which makes me very sceptical. Of course we all know that you should not believe everything you read on the internet! The famous French Mariologist Mgr Rene Laurentin is mentioned somewhere as having defended the apparitions at Medjugorje whereas in an interview asking what he thought of Medjugorje he says 'I have no answer - I am not obliged to answer that question' which hardly seems like a defence. One website writes 'The Vatican has only officially recognised 15 (Marian) apparitions but this does not necessarily mean that the others are not valid.' An interesting comment indeed. I keep an open mind on Garabandal (unlike Medjugorje). One thing I do remember is one of the seers being interviewed (then an adult running a New York pizza parlour) saying that a great horror would affect her children. Twenty or so years later 9/11 took place.